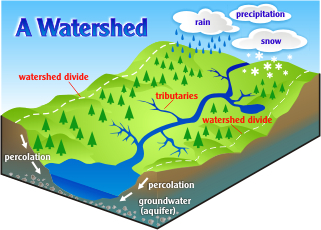 A watershed is an area of land where all of the run-off flows to a common body of water. From the air, a watershed looks similar to the branches of a tree where stream channels meet, each draining into a larger waterway (this is similar to how branches of a tree join and become larger until finally meeting the tree trunk). Watersheds can be many different sizes based on the scale used. For example, a watershed can encompass the entire Fraser River and all of its tributaries. The Fraser River Watershed drains an area that is approximately 220,000km2. 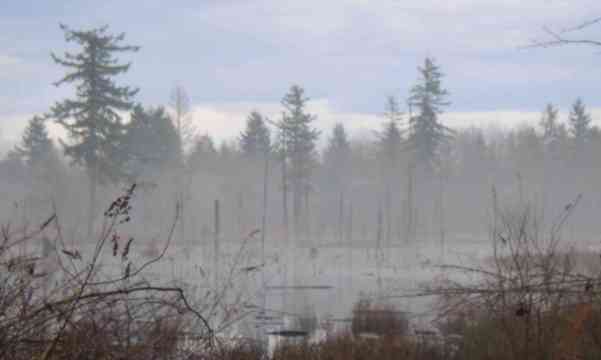 In contrast, the West Creek Watershed in Langley drains 17 km2. The West Creek Watershed is found within the Fraser River Watershed. Because all the water in a watershed shares the same fate and flows to the same place, watersheds are sensitive to pollution and land use. 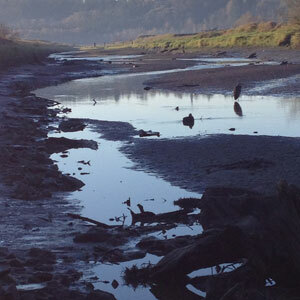 Industrial pollution, agricultural runoff, erosion and logging, untreated sewers and more can affect water quality not just in one watershed but in all others downstream. Watersheds contain streams and rivers that direct water to the ocean, so what we do on land and in our waterways affects our deltas, estuaries and oceans. 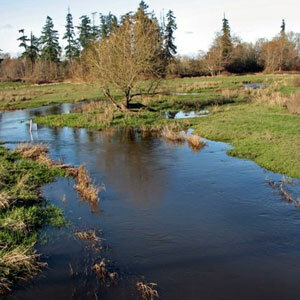 Langley is home to 11 major watersheds and hundreds of kilometers of streams. These waterways support an abundance of wild fish stocks as well as provide critical habitat for terrestrial wildlife and plants. West Creek flows through the not-yet-publicly accessible West Creek Wetlands and discharges into the Fraser River, east of Fort Langley. 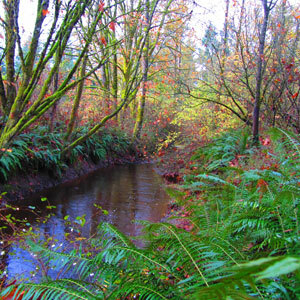 The West Creek Watershed provides important habitat for populations of Chum, Chinook, and Coho Salmon as well as many other species of fish. LEPS and Metro Vancouver staff work with volunteers from the Glen Valley Watershed Society to present annual walks through the West Creek Wetlands. Check LEPS events calendar for an upcoming tour or sign up for our newsletter to learn more. Murray Creek flows westward across the Township of Langley from Aldergrove through Murrayville to join the Nicomekl River in the City of Surrey. LEPS works with passionate volunteers to remove invasive species and to clean up streamside habitat. We work hard to help maintain habitat for rainbow and cutthroat trout, western brook lamprey, chum, coho and chinook salmon, steelhead, and three spine stickleback. 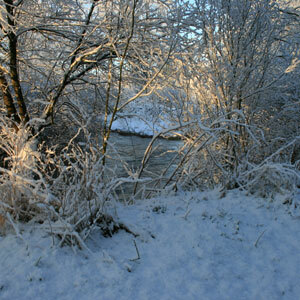 The Salmon River is one of the most pristine rivers in Langley. Its watershed is also one of the largest in Langley, draining approximately 76.9km2 and includes Coghlan Creek, Davidson Creek, Otter Creek, Union Creek, and the Salmon River. At least 13 species of fish are found in the Salmon River Watershed, including the endangered Salish Sucker. In November, walk the trails of Williams Park to see coho salmon spawning, or join LEPS at the annual BC Rivers Day celebration along the Salmon River to learn more about our rivers and watersheds. The Yorkson Creek Watershed drains the Willoughby and Walnut Grove neighbourhoods. This watershed is significantly impacted by urban development in these communities. Despite this, Yorkson Creek supports chum, pink, and coho salmon as well as cutthroat and rainbow trout, American shad, lamprey, steelhead, and both prickly and three spine stickleback. Join LEPS and the Yorkson Watershed Stewardship Coalition each spring for the annual salmon fry release or help us with streamside restoration to help maintain important habitat in this watershed. In Langley, Murray Creek and Anderson Creek both drain into the Nicomekl River as part of the Nicomekl Watershed. This watershed extends through the Township of Langley, City of Langley, and the City of Surrey before draining into Mud Bay at Blackie Spit. Fish species in this watershed include coho, chum, chinook, and pink salmon as well as steelhead and rainbow trout, three spined sticklebacks, western brook lamprey, brown bullhead, carp and sculpins. If you are interested in learning about the fish species in the watershed, consider volunteering your time with the Nicomekl Enhancement Society. This volunteer driven fish hatchery is always looking for additional volunteers to help at the hatchery and to help with annual fish releases. 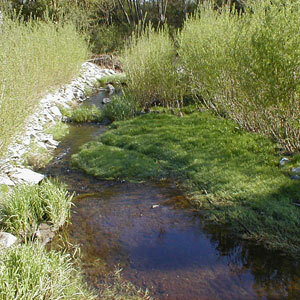 This watershed is one of the smallest in Langley (draining only 7.2km2). This watershed continues into the United States and enhancement projects can sometimes become international. Pepin Creek may be in one of the smallest watersheds, but it supports lamprey, longnose dace, coho salmon, cutthroat, threespine stickleback, American shad, and rainbow trout. 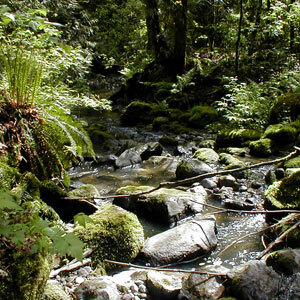 It is also home to the endangered nooksack dace and salish sucker. LEPS often works with local aquatic biologists and ecologists on restoration projects to enhance this important watershed. Projects have included soft ditch maintenance and invasive species removal. 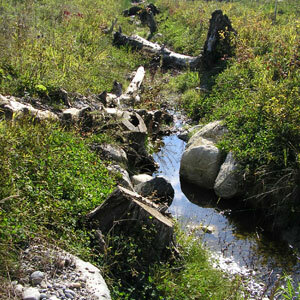 This watershed drains the Brookswood area into the Nicomekl River. This watershed is under the threat of high density development. Fish species in this watershed include chum, coho, steelhead, rainbow trout, pink, three spine stickleback, and cutthroat trout. LEPS has worked with citizen scientists in this watershed to record the movement of keystone species to help Township planners identify critical habitat for wildlife corridors. This watershed is one of the largest in Langley, draining an area of approximately 42.8km2. Bertrand Creek originates in the community of Aldergrove and flows into the Nooksack River Basin in the State of Washington. This watershed provides critical habitat for the nooksack dace and salish sucker- these fish are considered rare and endangered species. This watershed also hosts spawning ground for coho salmon. LEPS works with the Bertrand Creek Enhancement Society tirelessly to enhance and maintain habitat in this important watershed. Work includes planting native species in streamside habitat, removing invasive species, and both in-stream and stream side clean ups. We are always looking for passionate volunteers to help with work in this watershed. This watershed drains a portion of the Willoughby area towards the Serpentine River in the City of Surrey. Fish species present in this area include coho salmon, cutthroat trout, western brook lamprey, and threespine stickleback. LEPS works with many groups in all watersheds to maintain and mark new storm drains as part of the StreamKeepers program. The storm drain marking program has volunteers paint yellow fish beside all storm drains as a reminder that all storm drains go directly, untreated, into fish habitat. Contact LEPS to borrow a storm drain marking kit for your neighbourhood. This watershed includes the Township of Langley, City of Surrey, and is partially contained in the state of Washington. The main stem and tributaries of the Little Campbell River provide productive spawning and rearing habitat for a variety of fish species including coho, chinook, pink, and chum salmon, cutthroat and rainbow trout and many more. This watershed is under the threat of urban and industrial development. LEPS works closely with other groups in this watershed, such as the Little Campbell Watershed Society to provide educational opportunities for residents at the Campbell Valley Nature House as well as at other events throughout the year. Thank you to the Township of Langley for sharing data with LEPS for the creation of this webpage.